CBD Express Zero THC Full Spectrum 500mg CBD Oil 30ml is a full spectrum supplement derived from phytocannabinoid-rich oil that contains no solvents, no heavy metals, no pesticides and no THC. CBD Express has all the cannabinoids and terpenes naturally found in hemp except Delta 9- Tetrahydrocannabinol (THC). This non-psychoactive product allows for the distribution of there CBD oils into market segments that have zero tolerance for any levels of THC i.e. professional sports. CBD Express focus on delivering the best quality, the best efficacy, and an optimal pleasure of use. 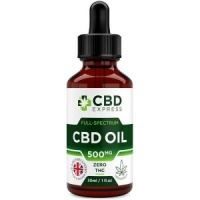 CBD Express uses a proprietary and patented extraction technology that preserves all the phytocannabinoids, terpenes, and plant lipids, while eliminating unwanted THC and chlorophyll. CBD Express believe that what they out of there products is as important as what they put in. Most CBD products in the market have traces of THC. CBD Express products contain zero THC. They utilize on-site chromatography testing and 3rd party batch testing to ensure accurate levels of phytocannabinoids and the absence of THC. Furthermore, there products contain no solvents, no heavy metals and no pesticides. Hemp Seed Oil, Grape Seed Oil, Peppermint Oil, Cannabidiol (CBD) extract (Cannabis Sativa), Stevia.